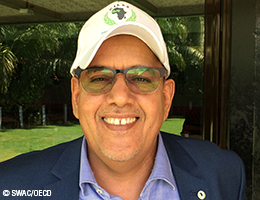 Mohamed Abdellahi Ebbe, a locust specialist, was appointed in May 2017 as Director-General of the CILSS Sahel Institute. Born in Nouakchott, Mauritania in 1964, Dr. Ebbe is an agricultural engineer and locust expert. He graduated as an agricultural engineer focusing on plant protection from the Abu Ghraib Institute of Agricultural Technology in Baghdad, Iraq. He then continued his training at the Ecole Pratique des Hautes Etudes in France where he obtained a doctorate in life and earth sciences. His thesis, Desert Locust Biogeography in Mauritania, was published in 2010. Mohamed Abdellahi Ebbe has more than 30 years of experience in locust control and environmental protection. From 1993-1995, he was national co-ordinator of desert locust control at the Central Operations Command during an infestation. He subsequently worked as a project co-ordinator or consultant for numerous bi- and multilateral programmes, including the FAO, the World Bank and the African Development Bank. He gained solid experience in supporting rural development and resilience of agro-pastoralist populations, particularly through the African Desert Locust Emergency Preparedness Project, (2006). He has been the Director-General of Mauritania’s National Centre for Desert Locust Control (CNLA) since 2006. In 2013, 2015 and 2016, he was also Mauritania’s national co-ordinator of a programme to fight against the malaria, dengue fever and Rift Valley fever vector – the mosquito. He is a member of the board of directors of the National Office of Meteorology in Mauritania. Dr. Ebbe teaches at the University of Nouakchott in the department of environmental biology. He participated in a large number of research projects and published numerous scientific studies. Dr. Ebbe also participates regularly in the supervision of dissertations and theses of students of diverse origin. He was awarded a medal of honour as a Chevalier de l’Ordre du mérite (National Order of Merit) in 2007 in Mauritania. He was also awarded a medal by the FAO on the occasion of World Food Day in 2010 and received the Sir Boris Uvarov Award for Applied Acridology in 2005.